front: Pte Cameron Pte Mihinui LCpl Condon Pte Cherry Pte Lewis Pte Flintoft hybrid weapon in SVN, US 81mm barrel and bipod, UK base plate and sight, two mortars per section. brown tubes are 81mm bombs. Mark Binning: A mortar section was deployed with each of the New Zealand rifle companies posted to an ANZAC battalion in Vietnam. 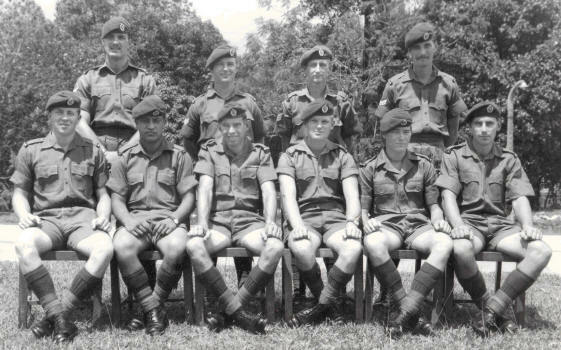 The W3 mortar section was formed at the same time as its parent company (May 1969) in 1RNZIR Terendak, Malaysia. In the six months prior to their deployment the section trained alongside W3 but with frequent trips for live fire training at the Asahan Ranges. Later Joe Mihinui swapped with Pte Ralph 3Pl, Bruce Young swapped with Vince Butler as MFC 2Pl, Pte Rich was posted from Coy HQ as radio operator but RTNZ in May 1970, replaced by Pte Marsh. Advance Party. 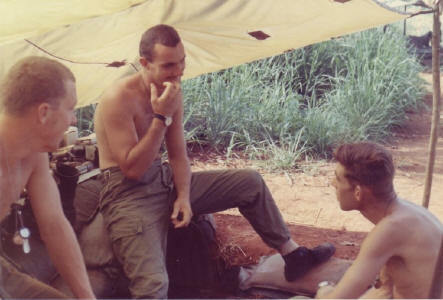 On 29 October 1969, the W3 advance party, including Cpl Binning, arrived in Nui Dat. Cpl Binning's role was to organise the hand over from Cpl Sonny Lakatani’s W2 mortar section. The main body of the W3 section arrived with the full W3 deployment on 14 November 1969. At Nui Dat the section came under command of Support Company 6RAR/NZ ANZAC Battalion. They moved into the mortar platoon compound in the Support Company lines and were allocated two tents and two mortar pits. One section of the mortar platoon was in residence most of the time to act as close fire support for the 1ATF base perimeter and TAOR [base local defence] patrols. Support Company was commanded by an Australian and had a New Zealander, Captain George Kereama RNZIR, as 2IC. The Mortar Officer was Captain JE Horan and the compound was very efficiently run by Sgt Stu Smerdon (both 6RAR) an ex British Army NCO now serving with the Australians. Both Horan and Smerdon were good sorts and quickly made the section feel part of the platoon. Initially, time was spent training on the new equipment – the mortar bi-pods and base plates were American and the training in Malaysia was with British components which were quite different. At the time a couple of the Australian sections were in the compound and the section worked alongside them, doing nightly H and I missions and manning the CP. The Australians were mainly conscripts, with the NCO’s being in the main regular force soldiers. All seemed good sorts and they accepted the new Kiwi section into the platoon. Operations ROSS and MARSDEN. After a short settling in period in Nui Dat W3 and W3 mortar section were deployed to Fire Support Base (FSPB) Discovery (Op Ross). Initially the section worked alongside Cpl Bob Passey’s V4 mortar section and were among friends during this settling in period. The section found that its methods of operation would be quite different from the training they had received in New Zealand and Malaysia. Now was the time to use the mortars in a proper combat role. At first the crews struggled with the American bi-pods as they were more cumbersome than the lightweight British ones. The crews seemed to be trying too hard and could not settle into the usual relaxed and efficient work mode until during one nightly firing Ross Cherry’s mortar had a bomb stuck in the barrel before firing. It’s extraction, using the standard methods taught at the time, proved fruitless in getting the bomb out. In the end caution was thrown to the wind, the barrel was removed from the base plate, turned upside down and barrel opening smacked smartly down on the base plate, which freed the bomb. A quick pair of hands caught the bomb just in case it had armed itself in the jolt to free it. Mark Binning recalls that this small incident was the trigger that settled the section and from that point on their performance was fast and accurate. 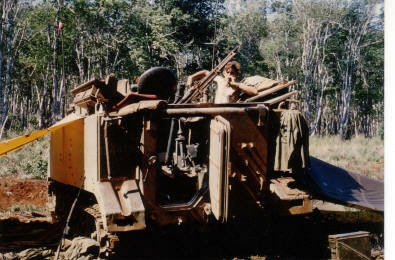 From FSPB Discovery the section then deployed with the main body of 6RAR on 1 December 1969 for Op Marsden. 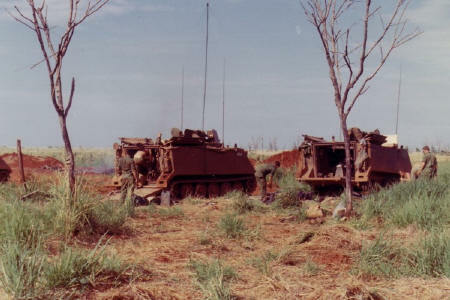 The main body of 6RAR was deployed directly from FSPB Discovery in a long armoured column while covered from a temporary FSPB [Lion] and occupied the new location by last light. W3 Company were air lifted to the new location the same day and patrolled toward the Song Rai river. 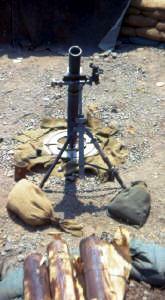 The W3 mortar section set up a dismounted position while another mortar section were based in AMC across the LZ. Heavy equipment and artillery were deployed by various helicopter types (Skycrane, Chinook and Iroquois). FSPB Picton was our first experience of settling up a position within a FSPB, at FSPB Discovery we had occupied positions established by another section. Digging the mortar positions, CP and living bunkers was assisted by engineer backhoes and bulldozers landed by Chinook helicopters which made light work of the extensive positions established. For the duration of this operation, the section and one Australian mortar section remained at FSPB Picton, supporting battalion operations in the area and providing logistical support for a 3rd mortar section located at FSPB Castle on top of the Nui May Tao mountain. It was on the Nui May Tao that the companies of the Battalion moved into a VC complex of logistic and supply areas. As a major logistic area for the VC there was much to gain from the operations against the VC on the Nui May Tao’s. In the end the Battalion captured weapons, munitions, ammunition, food, equipment, drugs and medical supplies. The long established major VC K76A hospital was put out of action. The section spent Christmas on the FSPB and were extracted by helicopter with the remainder of the battalion on 28 December for a belated Christmas celebration. Mark Binning recalls the lonely wait for extraction with the final few members of the battalion as dusk closed in. Finally, the last helicopter flight arrived, dropped off a SAS patrol and lifted them out. In early January the section had their first experience operating out of armoured mortar carriers (AMC125). A smaller operation using the Australian 3 Cavalry APC’s took the section east to the coast then south east along the coast before heading north back to NUI DAT. While a new experience then, APC operations would be repeated many more times during the tour. The Section would continue to operate independently from W3 Company. It did join the Company on three occasions – for the company stint at the Horseshoe, for operations with 2 Platoon on Long Son Island during the change-over of Australian Battalions (6RAR for 2RAR) and at FSPB Luise on top of the Nui Thi Vai’s (‘Wolverton Mountains’). Operation Matilda 15 – 26 January 1970. An operation conducted by the Australian 1 Armoured and 3Cav Regiments with B Company 6RAR and two mortar sections also deployed. 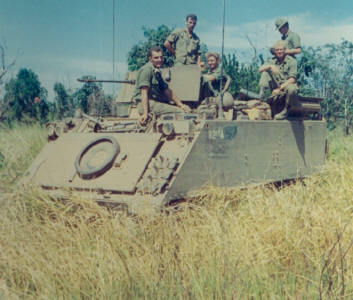 W3 mortar section was the only NZ unit to be deployed on the largest Australian armoured operation since WW2 and the first operation of its kind undertaken by the Australian Army in the Republic of Vietnam. The Operation swept through the area in Binh Tuy Province from the coast near Ham Tan to the May Tao Mountains well inland, then between Nui May Tao and Nui Be, and finally by road to Nui Dat. Any enemy in the area were pushed into 5RAR who were sweeping down from the NE, and any fortifications and/or gardens found in the AO were destroyed. The total distance covered was about 150 miles. The operation, although not a great success as far as number of kills and contacts were concerned, did succeed in driving large numbers of enemy into the path of 5RAR who engaged the enemy and accredit themselves with several kills. The timeline for mortar section activities in January 1970 is here. The Horseshoe. 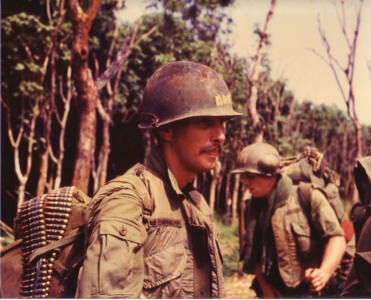 After Operation Matilda the section returned to Nui Dat for a few days before deploying with W3 company to the Horseshoe. The Horseshoe was a volcanic feature to the south east of Nui Dat. It is here ANZAC battalion company's rotated to train South Vietnamese Army Units (ARVN). Whilst at the Horseshoe, members of the Section exchanged places especially with the MFC's. Mark Binning, Bruce Young and Dave Condon all joined W3 patrols as MFC for operations in the Long Green area to the South and East of the Horseshoe. Bruce Young permanently swapped with Vince Butler to be MFC 2Pl [callsign 85B], Vince taking Bruce's place as ACPO. The section also trained ARVN on mortars, watched armoured engineer mine clearing operations on the outer slopes of the Horseshoe and were witness to aerial spraying over the base by USAF C123 Provider aircraft (see photo) - now such a contentious issue. plus section stores on ramp. Ops with 3Cav. 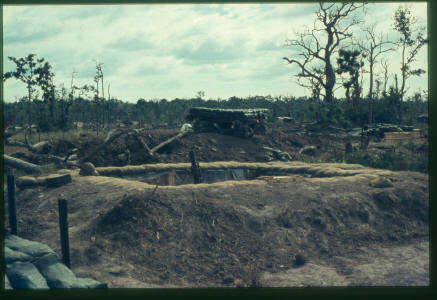 While W3's operations from the Horseshoe lasted for two months, the Mortar Section was called away after about four weeks for operations with 3Cav. 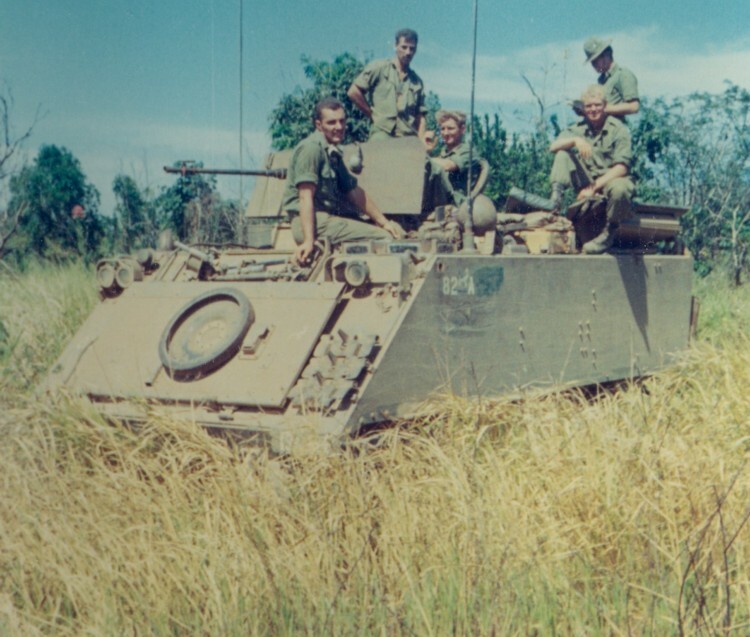 The first of these comprising one section of APC's (3 carriers) our 2 Mortar AMC's and a section of Assault Pion eers was to the Courtenay Rubber in the north of the province looking for NVA moving on supply routes to their units in the mountain areas. This type of operation suited the section, being free from the constraints of fire bases and always on the move with typical small unit freedom to cover ground and strike quickly. In the village of Cam My the Section enjoyed local 'Bah Me Bah' beer in a tavern under the gaze of a photo of Ho Chi Min who had many glasses raised in toast to him before the whole unit retired to the plantation to sleep off the effects. 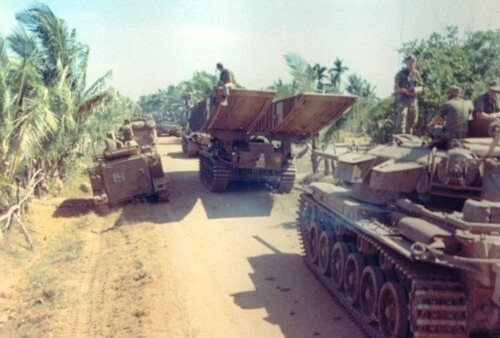 During this operation the APC's caught NVA in the rubber and the fire fight and pursuit involved some interesting manoeuvres by both sides [read more here] before the superior fire power of the APC prevailed. Mark Binning was not impressed when the bodies of the dead VC were one night brought back and unceremoniously dumped next to his bedroll. The Section returned to Nui Dat after three weeks, leaving the APC's and boarding truck transport on Route 2. The APC's then returned to the Rubber Plantation and within minutes one of the recently vacated AMC hit a mine, the driver and commander being injured. It was a sobering ride back to Nui Dat for the section with time to reflect on the place of luck in war. 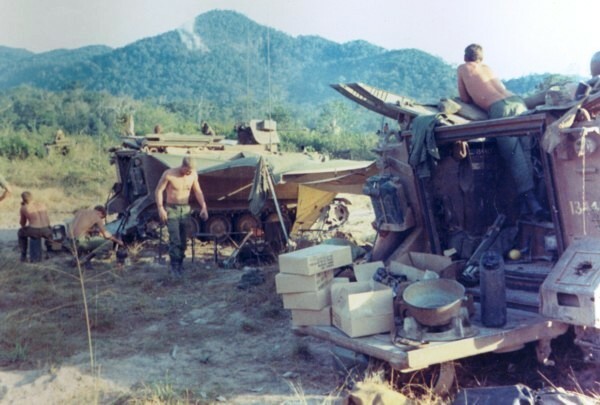 Within a day or two the Section was back on operations with 3Cav, to the north but short of the Courtenay Rubber, checking on abandoned villages before returning to operations again within the Rubber plantation. Units of the US Army Big Red 1 Division were in contact with NVA or Viet Cong to the South. Doug Lewis on sentry in the jungle covering in that direction spotted one NVA/Viet Cong approaching and was waiting for a good shot at him when his companion, an APC driver with 2 days in country, looked up saw the VC and panicked. Both arrived back at the APC's in a hurry, Doug frustrated at his lost kill. A hovering US Army Cobra Gunship was called in to work over the area and after he made a number of runs the Mortar Section fanned out to see if the VC had been caught by the rocket and machine gun fire. However before we had progressed too far the Cobra, despite having been told to hold fire, lined up for another run and only fast reactions saved the section from being on the receiving end of a friendly rocket volley. That evening we moved down to join the Americans. The US soldiers were young and jittery and littered the area with rubbish and after spending the night with them we were happy to be on our way back to the Courtenay Rubber with our 3Cav friends. ANZAC Day Parade. We finished our time with 3Cav just prior to ANZAC Day 25 April, joining the Battalion for their final combined parade on 25 April. The Section then rejoined W3 Coy HQ and 2Pl on Long Son Island during the changeover of 6RAR for 2RAR.